What do a bunch of party-going models and a drinks firm have in common? Answer: A give-it-large hedge fund owner with more money than sense. To recap... It took place just off Oxford Street. In a club called The Rose. You may recall that this is the place (if you've got no soul) that was recently promoted by its gloating owners as the wannabe hangout of the embarrassingly wealthy. And boy do we mean e-m-b-a-r-r-a-s-s-i-n-g. It recently made the Evening Standard and the Daily Mail and other 'tabs' when it was claimed by its owners--strange uh?--that one wealthy patron, himself the owner of a hedge-fund firm, blew a small fortune on drinks for his young all-male staff - a paltry £71K for ten, what a Scrooge!! According to the club's owners, the man who caused all the fuss wished to remain anonymous. (So why draw attention to yourself by throwing £50 notes around the club 'like confetti' then?) However, ironically, and somewhat contradictorily, the club's publicity-seeking owners appear not to have understood that the announcement would garner some negative publicity. Various blogs commented on the 'disgusting' behaviour of the individual concerned. The Rose Club promoters also presented a copy of what they insist was the 'check'; presumably to firm up the story for the (unsuspecting?) reporter who filed it. Remarkably it revealed that the waitress got extremely lucky that night. She received a £10,000 tip! The club owners' claimed that ‘Margaux’ on the bill was not in fact 'a real name'. But since our last post (in which we outed waitress ‘Margaux Nina’) she has posted a copy of the bill confirming the tip. Well, not quite… don't forget the models. Next Models London celebrated what was the end of 'an amazing year' with an "exclusive" party for its models, clients and friends at The Rose. 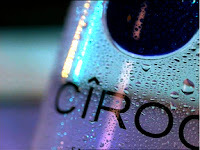 But, what' oh what is this: £44,400 was charged to the hedge funder's bill for a drink recorded as “Ciroc Methuselah“. A drink that we could not find listed anywhere else other than on the club's 'check'. Odd that. So, why would an extremely rich hedge-fund owner, who wishes to remain (partly) anonymous, invite negative publicity by spending £44,400 for a drink that was sponsored--presumably gratis--by the drinks manufacturer? Strange behaviour for a news-shy multi-millionaire who did not wish to be named? Or was it we ask a publicity s-t-u-n-t. If so, hoodwinking the unsuspecting public is not a very good way to develop trust around a brand.